PATIENTS on the Coffs Coast are being denied the extent of nurse care hours those in the metropolitan receive due to the current State Government classification of hospitals. That's the claim being made by the local branch of the NSW Nurses and Midwives Association, which is seeking to make the state's nurse to patient ratios a key State election issue. Joined by Labor candidate for Coffs Harbour Tony Judge local frontline health workers have rallied in Coffs Harbour. 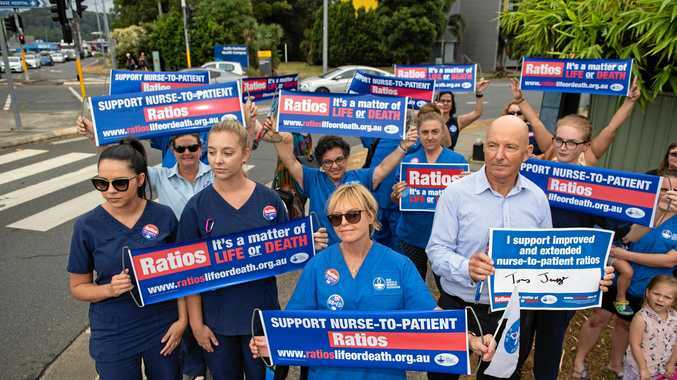 Peter Brookes, Coffs Harbour In-Patient branch secretary of the Nurses Midwives Association, said local nurses hold their patients' care and safety at heart. "There are a lot of issues in NSW Health that are affecting the day-to-day grind of nurses and ultimately our patient safety in our hospitals," Mr Brookes said. With higher numbers of drug affected patients presenting to emergency wards, hospital nurses like all frontline emergency workers are being put in harm's way. This week it has been revealed that some local male nurses are performing large parts of their shifts serving as security guards just to protect their colleagues. "Yes we are seeing an increasing amount of violence in our hospitals and more of our time is being spent on these things that we have to deal with on a day-to-day basis," Mr Brookes said. "This impacts greatly on a nurse's ability to be able to do their job in the health service. "So we are campaigning hard around ratios. We are complaining about ratios for our patients to increase safety. "Increasing nurse to patient ratios is proven to put patient safety at the forefront so we can provide the best quality care that we can." Mr Judge praised the honour behind the campaign as nurses make a stand for their patients saying it had State Labor's full backing. "This is not a campaign for more money for them, it is about better care for patients. I am very pleased to pledge to support their campaign," Mr Judge said. "This is literally a matter of life and death. Tired and overstressed nurses can make mistakes or fail to notice important signs about a patient. Those mistakes can be fatal. "Nurses need time to give patients the care they need and deserve. Good nurse to patient ratios ensure that nurses are alert and that they have enough time to provide quality care to patients." "A life in Coffs Harbour is worth as much as a life in Sydney, but the current State Government expects each nurse in Coffs Harbour to care for more patients than a nurse in Sydney. Nurses save lives. "The National Party claims to represent regional NSW, but they are part of a government that treats patients in Coffs Harbour as second class citizens." He said nurse ratios on the Coffs Coast were especially important given the State Government is undertaking a $190 million upgrade program that will increase the size of the Coffs Harbour Health Campus. "A patient who is uncertain and in pain in the middle of the night is not thinking about the nice new hospital building they're in," Mr Judge said. "They want a nurse who has enough time to spend with them to manage their pain and assure them that they are getting the right treatment. "You could employ a lot of nurses for the amount that the Liberal/National government in NSW is wanting on knocking down and rebuilding stadiums." Mr Brookes said under the current tiered system in NSW Health hospitals are rated in categories A, B and C determining the level of care that patients receive from nurses. 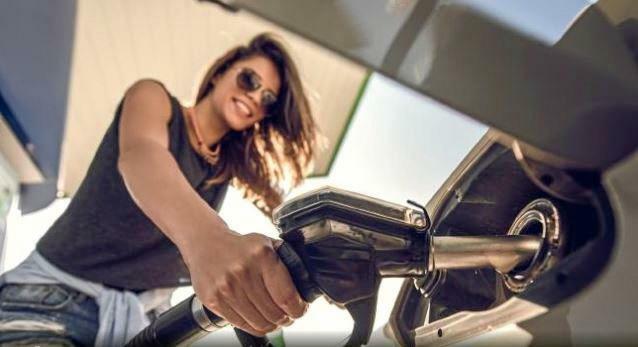 "So a category A hospital in Sydney gets six nursing hours per patient per day, whereas a category C hospital gets five hours, so one hour less per patient per day just because people choose to live in areas like Bellingen or Macksville," he said. "Whereas Coffs Harbour is a category B hospital so we get five and a half hours per patient per day - half an hour less in terms of patient care hours just because of our postcode." THE Mid North Coast Local Health District responded to this week's rally saying the industry award provides an agreed method for determining the minimum number of nurses required to provide direct clinical in NSW inpatient wards. "We value our nurses and midwives and acknowledge the vital and challenging work they do to support our community," MNCLHD Director Nursing, Midwifery and Workforce, Vicki Simpson said. "The skill, professionalism and extraordinary effort shown to patients each and every day is recognised and appreciated. "Safe and effective staffing in nursing and midwifery involves more than just staff numbers; it is about making sure we have the right number of staff in the right place at the right time and that means ensuring our hospital is staffed to meet activity and patient complexity. She said Coffs Harbour Base Hospital uses this agreed method, which allows flexibility to allocate nursing hours in a way that matches the busiest times and patient needs. Nursing rosters are said to be reviewed daily to ensure adequate staffing for patients are met and this also takes into account nurses' wellbeing, ensuring a reasonable workload. "The vast majority of patients and families attending our emergency department treat staff with courtesy. Should a situation escalate, hospital and emergency department staff at Coffs Harbour are supported by Health and Security Assistants and can call for urgent assistance," she said. "The safety of staff, patients and visitors to NSW public hospitals continues to be an absolute priority for the NSW Government. The State Government said in November 2018, Peter Anderson was appointed to review hospital security. "Across NSW there are more nurses than ever working in our public hospitals and health services with 51,890 part time and fulltime nurses as at June 2018," a government spokesman said. "With this year's budget, a further $96.9 million will be spent on nursing and midwifery workforce growth - that equates to about an extra 950 nurses in our hospitals. "With these enhancements, the NSW Government has increased the nursing and midwifery workforce by 9,889 full time equivalent positions since 2010, a growth of 25 per cent.